This document describes the process for setting up Harness Connected On-Prem. 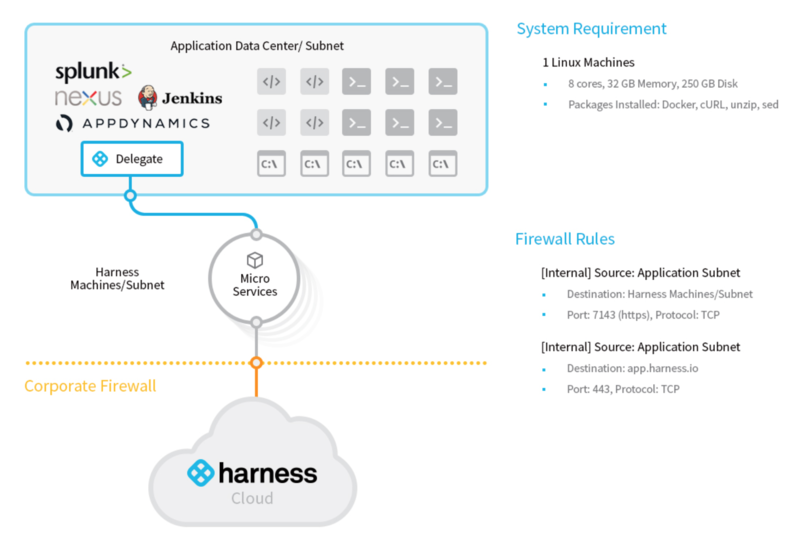 In the Harness Connected On-Prem architecture, the Harness Manager runs in your enterprise environment ("on-premises") and Harness manages the installation through a connection to Harness' Cloud. 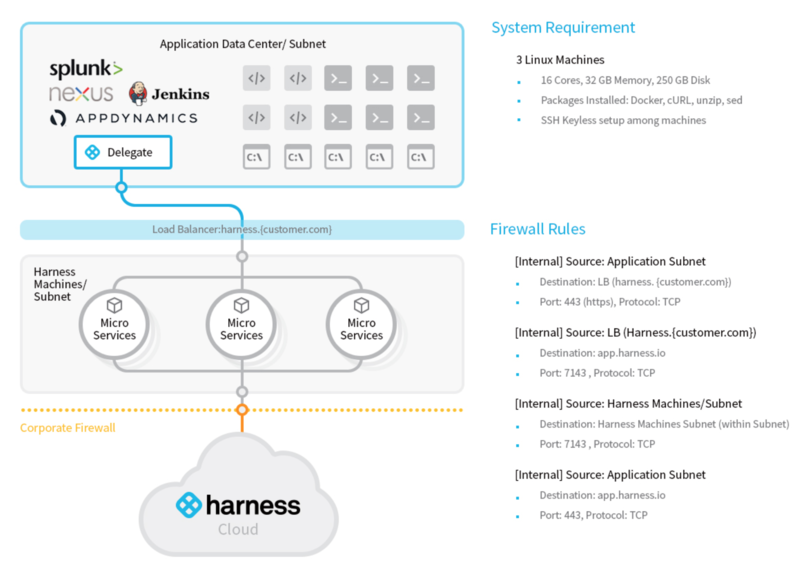 For more information about Harness Connected On-Prem, see Harness Architecture and On-Prem Overview. Each microservice is containerized and is deployed on every physical machine. Once you are signed up with Harness, you download and install an Ambassador that acts as a proxy between your data center and Harness Cloud. The Ambassador makes one-way outbound HTTPS calls to the Harness cloud, initiates the on-prem installation across your physical machines, and automates the Harness Connected On-Prem installation process for you. Harness Connected On-Prem installation is managed by Harness Support and takes minutes. Prepare your on-premises infrastructure for Harness. Provide Harness with your infrastructure information via email. Download and run the Ambassador, the tool Harness uses to initiate your Harness Connected On-Prem deployment, and notify Harness that the Ambassador is running. Harness triggers the installation and notifies you. Point your browser at the URL for your Connected Harness On-Prem. Download the Harness Delegate and begin setup. Prepare your on-premises infrastructure for Harness. There are separate requirements for Harness Connected On-Prem Evaluation and Harness Connected On-Prem Production. For the requirements, see Harness On-Prem Evaluation Requirements and Harness On-Prem Production Requirements. Once your infrastructure is configured, send the infrastructure information to Harness Support at support@harness.io with the subject Harness On-Prem Information. SSH interconnectivity is required among all three hosts. The SSH Key must be present on all machines so they may connect to each other. Harness support will make an account entry in the Harness cloud based on the information you sent and then provide you with an URL for the Ambassador download. Run the Ambassador on any one machine. After receiving the Ambassador download URL from Harness Support, perform the following steps on one or more of the hosts you provided to Harness. Download the Ambassador using cURL. Once the Ambassador is up and running, notify Harness Support at support@harness.io or the sales representative you are working with about your on-prem setup. Using Ambassador, Harness Support will initiate the deployment of your version of Connected Harness On-Prem onto your infrastructure. Harness On-Prem Evaluation has the following requirements. Harness On-Prem Production has the following requirements. Access to artifact servers, deployment environments, and cloud providers. Multiple delegates can be used and their scope can be managed. The Harness delegate does NOT require root account access. For more information, see Delegate Installation. A MongoDB database is hosted on the servers on which Harness is running. Harness makes periodic backups on the same servers. Harness will assist you with storing the backups on another drive. Also, you can simply perform regular backups of the drive yourself.